It’s outrageous that it should have taken this long for Angela Schanelec to make it into the Competition of the Berlinale—and ironic, given that it was a review of her film Passing Summer (2001), published in Die Zeit, that originated the term “Berliner Schule.” That film landed in the festival’s Forum sidebar, as did Afternoon (2007) and Orly (2010), and it’s only Schanelec’s eighth full-length feature, I Was at Home, But…, that finally got her invited into the main slate. She went on to win the Silver Bear for Best Director, making her the latest Berlin Schooler—after Maren Ade (Everyone Else, 2009), Ulrich Köhler (Sleeping Sickness, 2011), and Christian Petzold (Barbara, 2012)—to nab a silver statuette from a festival that has always had a fraught relationship with the group. Schanelec herself has never been particularly enthusiastic about her inclusion as part of the Berlin School. Even without invoking the whole debate over the legitimacy and continued relevance of the categorization, it’s safe to say that I Was at Home, But… makes for an uneasy fit. For instance, it could hardly be considered a critique of neoliberalism from a German perspective, one of the unifying characteristics laid out in the authoritative body of literature on the Berlin School authored and/or edited by Marco Abel. In fact, there is little that is specifically German about the film at all, as its portrait of motherhood could easily be transposed to any other Western country. 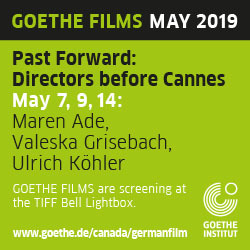 Gone are the allusions to broader sociopolitical realities found in Schanelec’s previous films, such as the current events unfolding in the background of The Dreamed Path (2016) or the postcolonial violence simmering at the edges of Marseille (2004). Apart from one character’s foreign nationality, which gets but a brief mention, there is little acknowledgement of an exterior world, and Berlin as a setting is also largely deprived of specificity. Although Schanelec has always de-emphasized the city’s symbolic significations in the many films she fully or partially set there (i.e., all her features except Orly), this time she appears to have chosen locations specifically for their interchangeability. Much of I Was at Home, But… takes place indoors, and the few building façades or streets that are seen offer scant means of orientation. Through a prevalence of full and medium shots, and lacking the big geographic and chronological jumps common to Schanelec’s narratives, Berlin is conveyed as an intimate, almost hermetic space wherein the small set of characters frequently cross paths, sometimes taking notice of one another, sometimes not. There is even a lengthy scene set on the popular shopping avenue Kurfürstendamm, one of Berlin’s most iconic locations, photographed to seem like virtually any other street. At the supermarket, the protagonist Astrid (Maren Eggert) randomly meets a film director played by Dane Komljen (already the notion of routinely buying groceries on Ku’damm is odd, never mind running into someone else doing the same). In a ten-minute tracking shot, they walk home together, discussing the use of actors in the director’s film. They hardly cross any other pedestrians, although in real life the pavement is teeming with shoppers and tourists, and the flashy window displays barely register as the camera and performances direct our attention to the conversation’s rhythm, with the director remaining hilariously composed while Astrid discharges an increasingly impassioned rebuke of his work. This tight focus is expressive of the film’s theatrical dimension, while simultaneously feeding into the existentialist thrust of the narrative. Following an Edenic prologue involving a donkey, a dog, and a rabbit (which was shot in Serbia), the film relocates to Berlin, where Philip (Jakob Lasalle), Astrid’s 13-year-old son, returns home after having disappeared for an unspecified length of time. The Ozu classic to which Schanelec pays titular homage, I Was Born, But… (1932), charts the changing dynamics within a family after the father humiliates himself in front of his two young sons, shattering the idealized image they hold of him. Philip’s disappearance, also representative of his loss of childhood innocence, triggers an analogous crisis within his family, though Schanelec inverts the perspective by focusing on the emotional repercussions for Astrid. Her story is punctuated with scenes of Philip and his classmates rehearsing Hamlet at school, with Philip in the role of Hamlet and the children reading from Schanelec’s own published translation of the play (co-authored with her late partner, the theatre director Jürgen Gosch). There are echoes between the play and the film’s plot, most notably the structuring absence of Philip’s father, who died two years earlier, and the conflict between Philip and Astrid. Considering that the passages performed by the children refer to Hamlet’s dichotomous conception of femininity, their sporadic break-up of the narrative has the effect of a chorus. Schanelec insists that these parallels, as well as those between Astrid and the iconographic references to the Virgin Mary, are incidental. Although the feminist reading that these elements seem to invite is unintentional, their inherent symbolic strength nevertheless lends a tragic dignity to Astrid’s suffering that doubles as a universalizing gesture. The potentially normative implications of such juxtapositions are offset by a subplot involving one of Philip’s teachers, Lars (Franz Rogowski), and his girlfriend Claudia (Lilith Stangenberg). In a poignant dialogue set at dawn, Lars attempts to change Claudia’s mind about not wanting children. “I’m scared of vanishing…Then there’s nothing left,” he pleads, but Claudia maintains that she has a “mission” and although she can’t articulate what that mission is, she knows it doesn’t involve becoming a mother. The notion of searching for something essential yet impossible to describe or even fully conceive represents an existential longing that has afflicted all of Schanelec’s characters to date, and which drives the films themselves. In striving for the ineffable, I Was at Home, But… takes a step further along the trajectory towards a spiritual cinema that began with The Dreamed Path. With this shift came a more open embrace of Bressonian motifs, such as the synecdochic close-ups of body parts, especially hands, performing purposeful actions. The entire climactic duel between Hamlet and Laertes, for instance, is composed of such shots. Throughout the film, the camera very rarely moves and characters often remain immobile, creating ravishing tableaux whenever several figures occupy the frame. The pervading stillness is punctured at specific moments through tactics that burst the mise en scène’s carefully maintained austerity. In the most affecting scene, Astrid visits the graveyard where her partner is buried. It’s night, and when she climbs over the graveyard fence, the film’s only piece of extradiegetic music starts playing. As M. Ward’s mournful cover of David Bowie’s “Let’s Dance” fills the soundtrack, Astrid collapses in front of the tomb, triggering a flashback that shows her, Philip, and his younger sister Flo (Clara Möller) dancing in front of the father’s hospital bed. The scene’s emotional force is devastating, with the implementation of two showy devices (in strictly relative terms) provoking such a shock that the film’s reality is momentarily ruptured, allowing for an incursion of the sublime. Here, it happens to be embodied by a quail that comes to keep Astrid company by the grave. Despite the allusions to the Virgin Mary, the supernatural presence of animals signals that the film’s spirituality is not to be read as religious. The pastoral scene from the opening reappears in the final moments. Should the donkey looking out the window be interpreted as a deific incarnation, beatifically and impotently spectating the film’s human drama? Or is it simply a donkey, beautifully illuminated by the golden sunlight falling on its face? Probably the latter, and yet, when it turns its head to look at us, its gaze pierces right through our soul. Cinema Scope: In this film you work with Hamlet, and Afternoon was a loose adaptation of Chekhov’s The Seagull. You’ve only ever adapted plays, never another type of text. Is there something about theatre that you find translates particularly well to film? Angela Schanelec: I have sometimes thought about adapting literature, but there was never a novel that I found suitable, that really spurred me to do it. I think that jumping from one form to another—from prose to a script, for instance—is something completely different from adapting a play. Maybe it’s also because when I find a novel interesting, that interest is almost always tied to the language, so I have the impression that the story that is being told has already found its form. And that’s not the case with a play. A play is written to be performed; it’s not a form in itself. It must have something to do with the fact that the border I have to cross to make that decision is somehow smaller. Scope: You said that the starting point for the film was the idea of a son disappearing for a week and then reappearing. When did you think about including Hamlet? Schanelec: When I thought about how to show the class. I immediately knew that I wanted the children to perform, and then I immediately thought about Hamlet. I didn’t look for other potential pieces and also didn’t analyze whether it was the right or wrong choice. I just started thinking about which scenes I wanted to include. Scope: What struck me in this film is that, for the first time, you prominently include very strong, well-known references, which automatically invite interpretation. There’s Hamlet and then there’s also Christian iconography: Maren Eggert’s pietà pose in the swimming-pool locker room, as well as the Mater Dolorosa sculpture by Pedro Roldan in the museum. Schanelec: Yes, though it wasn’t planned that way. In the museum, the Gemäldegalerie, I knew that the rooms had wallpaper of different colours. The art was also an element, but the rooms themselves were our main motivation for going to see whether we could film there. We checked which colours were in which rooms, which sightlines were possible from room to room, and only then did we start thinking about images. The rooms that suited us best are the rooms that contain the art that is now visible in the film. The art wasn’t the factor that brought us there initially. At the swimming pool, it was only later that it became clear what that image would evoke; it wasn’t predetermined. Although, during the preparations I had sent Maren a picture of Georg Pencz’s painting Venus und Amor. Scope: Three of the four passages from Hamlet included in the film deal with the impossible expectations that Hamlet has of Gertrude and Ophelia, and the Virgin Mary is of course the saintly ideal of motherhood. These elements are not related to the film’s narrative? Schanelec: Of course, such connections do exist, but I don’t construct the film along these connections, they just arise. It might be difficult to grasp, but at a certain point things come together. I chose the Hamlet scenes according to various criteria. Content-wise, of course: it was clear from early on that the last scene, where they all die, would be included. But apart from the content, whether a scene worked or not was also very much dependent on the language, on what I felt would have been possible for the children to perform. I think I’m completely non-academic. Not just about my work, but also in the way I approach the work of others. I don’t at all engage with academic discourse. My engagement is very direct, and if I have access to the work, then it’s through the emotions that it touches or awakens. I wrote this film so fast and then I hardly changed anything about the script. I just shot it. It seemed so raw to me. I always had the impression that I was making something raw, but…I have the feeling people don’t believe me when I say that I don’t plan things out. I wouldn’t have chosen to make a film about a woman who raises her children alone; I would never have picked that as a theme. But there was the boy, and then there was the woman. And I noticed that I didn’t feel like inventing a father. I wanted to invent the mother, invent the sister, but not the father. And that’s how it was. And that’s why it only comes up late in the film that he died, because it wasn’t planned. It’s all conceived step by step. Scope: Could you elaborate on your criteria for choosing the Hamlet passages? Schanelec: For example, the first, “Nor earth to me give food, nor heaven light!” is in the play within the play. It’s not merely in verse, it also rhymes all the way through. And in my experience, the stronger the form of the words, the easier it is for the actors—those who are capable, of course—to rely on the words, to let themselves be guided by them. That’s why I absolutely wanted a rhymed passage, and that’s why that one was included. I actually only ended up moving two scenes around in the edit, and that’s one of them. Now it’s the first text you hear in the film. In the play within the play, it’s the scene where the woman says to her husband that when he dies, she will remain chaste. Of course, this can be read in the context of Astrid’s story, but it wasn’t planned like that. The scene originally came up much, much later in the script. And then I moved it, not because of this reason, but because of the way the scene is shot, the impact it has. Then I realized, “Ah, OK, now there’s a direct relation to the mother.” And that’s something I accepted. Scope: And how was it having the children perform Shakespeare? Schanelec: Great! Well, it didn’t work with every child, that’s obvious, but I realized right away that it was possible to find the right children. It would just take time. We had a very, very long casting process. We auditioned maybe a hundred children and I never had any doubts that it wouldn’t work. Scope: Did you write Astrid’s role with Maren Eggert in mind? 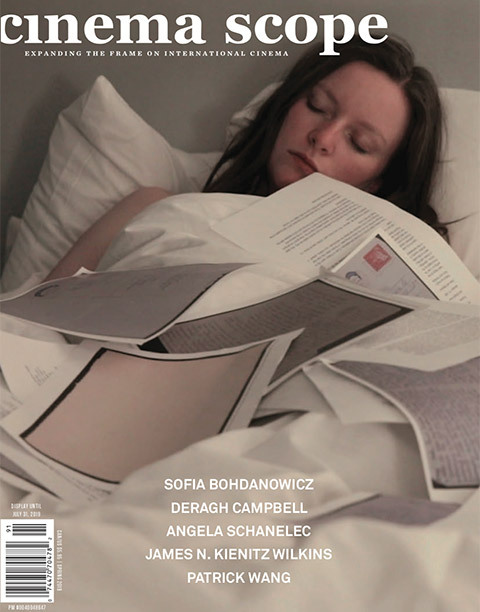 Schanelec: No, but when I started writing it very soon became clear that I would ask her. Scope: This is your fourth consecutive collaboration. How would you describe the role she’s come to play in your filmography? Schanelec: I actually don’t know how I would describe it. She’s increasingly becoming part of my thought processes. But it’s very unusual for me, because usually when someone has played a big role in one of my films, then the actor is so merged with that role that I can’t work with them again, because I won’t write that role again. With Maren it developed differently, and I could also imagine it developing differently with Tobbi, who played the homeless man in The Dreamed Path. It’s difficult to explain, but it has something to do with their bodies, as well as their faces, which can function as surfaces for me to project on. Scope: Knowing that your children were roughly the same age as Philip and Flo when their father passed away, it’s automatic to recognize you in Astrid’s character. Was the intimacy you developed with Maren Eggert necessary for you to entrust her with such an autobiographical role? Schanelec: No, because making this film was no different from making the others. For me, it’s a story, just like it is in the other films. I think that whenever anyone engages seriously with something, there will be a personal connection. And this connection is sometimes more obvious, sometimes less. In this case it’s particularly obvious. It’s open for everyone to see, simply because of my personal story. But it’s just as much there in the other films, only it’s buried deeper. I’ve been asked whether it was difficult for me to make this film. I find that a really weird question. Firstly, I don’t find it relevant. I don’t want to make a film about myself, that’s not what I’m doing. Or, rather, I’m making myself the subject to the extent that all artists do. That’s normal. But it’s not therapy. That’s a horrible thought! And I also think that what I made this film about, the themes that I deal with, are much too universal. The question of whether to have children or not, that concerns everyone. Certainly. Scope: In the long scene with the film director, Astrid criticizes him for having actors perform alongside cancer patients in his film, saying that such an ontological dialectic—mixing a dying person’s honesty with an actor’s pretense—obfuscates truth, because truth always succumbs to artifice. To what extent can Astrid’s speech be interpreted as a statement on your part? Schanelec: Everything she says touches on themes that have preoccupied me and that I’ve thought about, but if her speech reflected my personal belief then I couldn’t make films. I couldn’t let anyone perform or ask anyone to perform. I believe in the effect produced by performance, and I believe that performance can create truth, just not in the way it’s often done. I always felt that the advantage of writing dialogues, as opposed to a text—which is a statement—is that there is a situation involving two people and one can contradict the other. This scene only exists in this context. The way Dane reacts—or, rather, performs—is what allows Astrid to speak that way. For example, she says early on—and the viewer knows this as well—that she hasn’t seen the whole film. For me, it’s very important that in this situation she would discuss the film without having seen it until the end, which already calls her judgments into question. And that’s how it keeps going. Scope: You’ve said before that Bresson was one of the main reasons you initially turned to cinema. I find it interesting that his influence should be more prominent in your two latest films rather than in your early work. Schanelec: It’s true. When I was acting in theatre, before I went to film school, L’argent (1983) came out and that film completely shocked me. I had never seen anything like it. I was working in theatre, acting on stage, and in his whole conception of performance, in the way he worked with actors—I mean, models—I recognized a path that could allow me to make sense of what I was doing. Then I started making films, but Bresson’s film language is so explicit, it would have been impossible for me to take it on. I think—and this will probably be difficult to understand—that it took me a long time to grasp where Bresson’s language came from. And when I eventually came to use a similar language, framings, and associations, it didn’t happen because I rediscovered Bresson, but because I had the impression of having reached a point where I’m able to do something similar. The road is behind me now. It’s not that I shoot close-ups of feet because I like it when Bresson does it, but because I got there myself. Also, the donkey: Au hasard Balthazar (1966) is without a doubt one of the most beautiful films that I know, but it’s not just because of the donkey, there’s a lot more. The donkey is a donkey. I have always loved donkeys, long before I watched Au hasard Balthazar. But Bresson, too, must have somehow gotten to the donkey, he wasn’t citing himself. And I mean, those shooting days with the animals were the happiest of my life! Scope: So much for the rule that one should never work with children and animals. Schanelec: That counts for the other actors, not for the director! Scope: You mention that it was Bresson’s concept of models that initially had an impact on you. And yet, I wouldn’t describe your actors as models. Schanelec: The children, yes, but not the adults. I found it really surprising that in some of the reviews Lilith and Franz’s performances were described as static. I don’t understand that at all. Just because they don’t move in the last scene? Actors can never perform like non-professionals. If that’s what I wanted, I wouldn’t be able to hire actors. But I purposely use actors for certain situations and characters. A non-professional could never do what Maren does in the long scene with Dane, and this doesn’t exist in a Bresson film. Scope: It was the first time since film school that you worked with a cinematographer other than Reinhold Vorschneider. Was there an adaptation process? Schanelec: I had seen two short films that Ivan Markovic had shot, which were directed by Mate Ugrin, who was one of my Master’s students in Hamburg, where I teach. I met Ivan because of these shorts and then I immediately decided to work with him. We took advantage of the pre-production to get to know each other: Ivan helped me with all of the location scouting and also participated in the whole casting process. And across these many months, we slowly grew closer. Scope: In the Berlinale press conference, you talked of finding the “correct distance” for your images. Could you elaborate on this notion and describe how you and Ivan worked towards finding this correct distance? Schanelec: I could also have said the correct camera position. Every moment has a decisive distance with regards to what is being photographed, and it’s this distance that makes the image. And then, cumulatively, it’s what makes the film. It’s not interchangeable. If I end up settling on a distance, then it’s also the correct one. And, unfortunately, I can’t say, “No, wait, we have to go closer because otherwise someone might not understand what I mean.” That’s what’s crucial: how far away I am, or how close I am. It’s something so fundamental, that I usually already have an idea of it while I’m writing. Scope: So it’s not a process. Schanelec: Usually I know it pretty early on. It might also have to do with the fact that I don’t first shoot a master shot and then individual close-ups. I could never think like that. But there can be situations where we only discover the right distance during the shoot. For example, there’s a shot of Flo with two boys by a window. We did five takes and for the first four we were a lot further away, because I felt the room was right but somehow it never worked. And I couldn’t understand why, because I was certain that the distance was right. But with each take, I was never satisfied, and I didn’t know what the children could have done differently. After four takes, we said, “OK, let’s go closer.” And then it worked! I had to see it in order to be sure. It’s absolutely crucial. Interview translated from the German by the author.